A new HVAC system is often a significant home expense many homeowners tend to put off as long as possible. After all, your heating and cooling equipment is often out of sight out of mind. However, knowing the status of your heating and cooling system can help you save money when it comes time for replacement. How Long Should Your Current System Last Before Upgrading To A New HVAC System? It’s important to note furnaces generally have a longer lifespan due to not being exposed to outdoor elements that air conditioning units must battle. There is also the coolant factor. Many of the air conditioners that are 10 years or older run on r22 refrigerant. As r22 is being phased out due to environmental regulations, the price has been on a sharp incline per pound. This variable has been a major decision factor for homeowners when making the decision to repair or replace their AC unit. New HVAC system equipment has come a long way over the last decade. Most of the innovation has been driven by homeowners looking to make their home more energy efficient. Which makes perfect sense given that heating and cooling on average are responsible for almost 50% of your home’s total energy consumption. In addition to technological advances in higher energy efficiency, many of the new hvac system upgrades often come with great rebates provided by local energy companies. Even the manufacteurs often run rebate programs to help entice homeowners into making the switch. Below outlines some major changes in how new HVAC systems are manufactured to help improve efficiency and performance. Most of the high efficiency HVAC systems now run on ECM Motors. An ECM motor stands for Electronically Commutated Motor. This allows your system to perform at variable seed. Reaching maximum speed only when your home desperately needs to be heated or cooled. PSC motors only function by turning on and off. Because PSC motors do not have the ability to perform at variable speeds, it remains at one constant speed when operating. Having a new HVAC system with an ECM motor can help reduce energy usage by up to 75% depending on the home. All while keeping your home temperatures more consistent even throughout extreme temperatures. This speaks more towards furnaces than AC units due to being inside. Noise control has been a major upgrade on a lot of newer home furnaces. Most new furnaces now come equip with components such as noise baffles, better insulated panels and motors that operate much quieter. Especially with variable speed motors that don’t cause that drastic on and off sound. More and more homes are investing in smart thermostats to help optimize their heating and cooling usage. Almost all of the new equipment have technology built into the control board to help faciliate these wifi thermostats. When fully setup correctly, homeowners can monitor their energy usage and even control their thermostat from a smart phone. Forking over a lump sum in order to replace your HVAC system can often be difficult for the average homeowner. At Superior, we offer multiple financing options designed to fit your specific lending needs. Our team works with you on helping secure the best financing terms, so you can enjoy the comfort of a new HVAC system without breaking the bank. We are currently running a great promotion that allows homeowners to upgrade to one of the most highest efficiency new HVAC systems on the market. For a limited time, customers can upgrade to a 20 SEER Bryant Evolution™ Extreme HVAC system at the same price as the 5 stage, 18 SEER model. That’s a savings of over $3,000. The offer also comes with a FREE 3 year labor warranty and 10 years parts warrany. Our team of comfort specialists are here to help answer any questions regarding new high efficiency HVAC equipment. 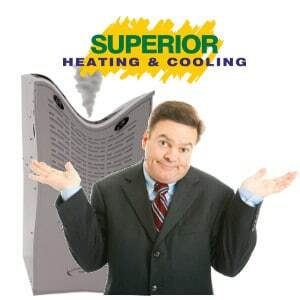 If you are interested in receiving a FREE quote on a new HVAC system, call us today at (314) 209-7500 or fill out the form below and a Superior comfort specialist will be in contact with your shortly.